Much like empires, most critically beloved bands have a life cycle. First, a group of young upstarts finds themselves born in the fires of a groundbreaking sound, then they continue to tweak or hone that sound until, inevitably, they fall out of favor with the powers that be or otherwise mutate their sound into something unrecognizable. HEALTH, the indescribable, (though often shoehorned into the genre of noise-rock) trio from California, appears to defy the life cycle yet again with VOL. 4 :: SLAVES OF FEAR by continuing down the path set on DEATH MAGIC, only this time with more glam, more glitz, more gore and a heaping spoonful of trademark nihilism. In case you were worried HEALTH would sell out, worry no longer. VOL. 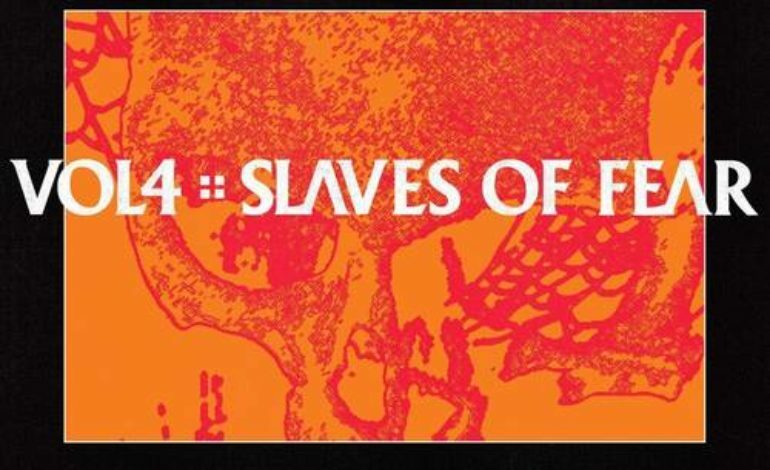 4 :: SLAVES OF FEAR might be their most brutal, unrelenting record to date, and somehow it still remains among their most accessible. The tightrope act being pulled off here should be impossible; HEALTH should have tumbled into the pit of spikes sometime around when Get Color was announced, but here they are. For those who are unfamiliar, HEALTH began as a fairly standard, albeit quality, noise rock band who showed a penchant for a little more synth and a little less grit. It was on 2015’s DEATH MAGIC where everything shifted. Much like DEATH MAGIC, VOL. 4 :: SLAVES OF FEAR continues down the seemingly impossible path of EDM, noise, noise rock and industrial with startling success. Tracks like “GOD BOTHERER,” “FEEL NOTHING” and “SLAVES OF FEAR” are pulse-pounding bangers that would sound excellent while huddled outside of a warehouse party you weren’t quite cool enough to get into. But this album isn’t just one dimensional. Both “DECIMATION” and “PSYCHONAUT,” the bookends of the record, are firsts for the group. Both tracks either feature the band singing softly or playing cool atmospheric guitar tones. On “DECIMATION” only the humming synth reminds you that chaos is never far behind on a HEALTH record, while “PSYCHONAUT” does eventually evolve into a full-blown noise fest. “DECIMATION” in particular communicates a desire to know more and more, but as it progresses the tone becomes more dire than somber, more rageful than melancholic. Again, we see that in the world of HEALTH there are no answers, and the few that we may find are never satisfying. Luckily the record is. As you may have guessed – this is not the album to listen to if you’re trying to be a happier person, though some of the pulsing club beats may betray that statement. A constant nihilistic bent pervades the album. “No pain has purpose, no one above to judge us” Duzsik whispers before the coming storm on “SLAVES OF FEAR,” sticking fast to the mission statement they have shouted for four albums now. Most cutting moment of all is the song “PSYCHONAUT” where after an uncharacteristically soft acoustic intro, Dizsik croons, “I’m only here once, once is enough. Don’t bring me back.” Today many will likely find something to relate to in this statement, especially in these uncertain times, when life seems to be comprised of trials and little else. He’s not asking you to take him off the planet or even end this suffering. He’s just imploring you not to make him do it again. HEALTH also takes this album as an opportunity to open doors that they have only knocked on in the place, and to kick down doors they have opened. It’s dancier and weirder than the (slightly) more reserved DEATH MAGIC. “NC-17” in particular plays with reverb in ways that they have only teased on previous albums. The result is disorienting, almost panic-inducing as the layers of vocals threaten to drown out melody entirely. At a glance, it’s difficult to say where this puts HEALTH on the fall of empires scale. If one were to venture a guess, it’s likely that this is their prime, but then again, we’ve seen them in a prime once, and it’s not unlikely they’d do it again. VOL. 4 :: SLAVES OF FEAR reasserts HEALTH at the forefront of the conversation in noise rock, though it remains to be seen if anyone will or even can follow in their footsteps. For such a well-beloved band, there is little analog to their sound, but so long as they keep bringing the heat like this, it’ll be more than enough to keep fans satisfied.